FilmAfrikana, founded by Norwegian-Ghanaian Lamisi Gurah, is an independent Oslo-based film festival whose purpose is to expose the Norwegian public to films by people of Africa and the African Diaspora. Providing a different perspective is an important goal for Lamisi Gurah. Films that deal with cultural, political and social issues, showing realistic, positive images of black people, counter the dominant media portrayals of a helpless, war-ravaged, disease-ridden continent. Her hope is that initiatives such as FilmAfrikana will provide new knowledge and introduce debates about the issues covered. A goal as well is to collaborate with other film festivals and to reach out to schools and cultural institutions, and eventually to be able to provide Norway-based distribution outlets to promote African and African Diasporan films. 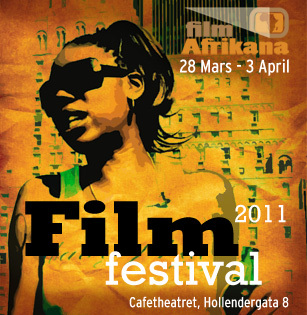 This year's festival, which ran from 28 March to 3 April 2011, focused on women in front of and behind the camera. British-based Florence Ayisi from Cameroon presented her film Art of This Place: Women Artists in Cameroon (2011) followed by a debate and Q&A. The screening of Say My Name, a worldwide documentary project about women, featuring Say My Name Africa, preceded a discussion by Monica Ifejilika and Amina Sewali. UK-based Sonia Godding Togobo from Guyana, premiered her film Adopted ID, which traces the experiences of Judith Craig, who, adopted in a Canadian family as an infant, returns to Haiti as an adult to find her birth family. Moderated by Hannah Wozene Kvam, Sonia and Judith discussed the making of the film, Judith's journey, and their interest in using the film to build awareness about the many issues explored in it. Having lived a similar experience, Hannah served as both discussant and eyewitness. Her film Wozene, min siste favoritt, Wozene, the last favourite, co-directed with Ingvil Giske, follows her own path: adopted into a Norwegian-based Ethiopian family as an infant, she returned to Ethiopia as an adult in search of her biological family. Invited to present her research and work on African women in cinema, under the title, "African Women in Cinema, Past, Present and Future", Beti Ellerson traced the presence of women professionals in African cinema from its birth using excerpts from her film documentary Sisters of the Screen: African Women in the Cinema. In addition, she discussed tendencies and relevant moments in history, providing points for future inquiry and discourse. During the same evening, expat American artist, Zainab McCoy, a longtime Norwegian resident, presented her short experimental film, Everyday is Martin Luther King Day, an animated discussion ensued. The issues around identity, positionality and social location that permeated the films and debates are indicative of a growing interest in focusing on African experiences from a global perspective. Moreover, they reflect the goals of the Afrikan History Week, the Nordic Black Theatre and FilmAfrikana, to provide venues in which topics regarding the experiences of people of African descent may be raised, debated and understood.